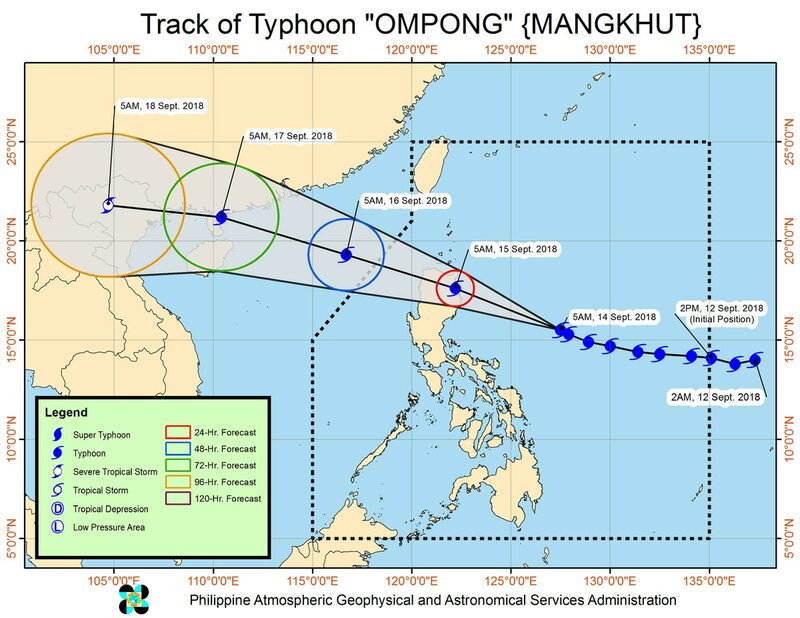 MANILA Signal number 3 has been hoisted over 3 areas in Northern Luzon as Typhoon Ompong (Mangkhut) draws closer to land, the state weather bureau said Friday morning. Winds of 121 to 170 kph can be felt in the next 18 hours in Northern Aurora, Isabela and Cagayan, PAGASA said in its advisory published at 8:00 a.m. Tropical cyclone warning signal 3 can also create moderate to heavy damage, according to the bureau's scale. It also warned that waves may be higher than 14 meters and that storm surges are possible in coastal areas. Ompong is expected to make landfall in the Cagayan-Isabela area early Saturday. PAGASA said the habagat as enhanced by Ompong will bring moderate to occasionally heavy rains over Visayas while scattered light to moderate to at times heavy rains over Palawan, Zamboanga Peninsula, Northern Mindanao and Caraga. The bureau asked residents of these areas to take appropriate actions against possible flooding and landslides, coordinate with local disaster risk reduction and management offices, and to continue monitoring for updates. Fisherfolks and those with small seacrafts are advised not to venture out over the seaboards of areas with TCWS and the eastern seaboards of Visayas and of Mindanao. At 7:00 a.m., the eye of Ompong was located at 605 km East of Baler, Aurora and is moving west northwest at 20 kph. The typhoon was packing aximum sustained winds of 205 kph near the center with gusts of up to 255 kph.